NOTE: Designer linear fixtures are custom built to order. Extended lead times and minimum ordering quantities may apply. Please contact Customer Service for additional information. This fixture is designed for suspension mounting for direct/ indirect applications where aesthetics and performance are both needed. Virtually glare free and shadow free illumination. Designed to mount on exact 4 foot, 8 foot, and 12 foot centers. Joiners will accept stems, single cable, and power cords as supplied by Horizon. Louvers available in white or semi-spec aluminum. 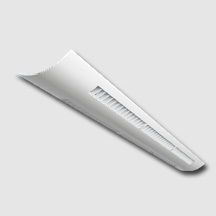 Louvers give a better than 45 degree cutoff to the lamp. Two die cast aluminum architectural ends available (Spade, Bull Nose). Optional lamp sleeves are available that allow for the adjustment of the up/down light produced by the fixture (order one per lamp). Heavy gauge roll formed steel housing with perforated pattern. Units are shipped with die cast aluminum joiners installed for suspension and structural continuity.